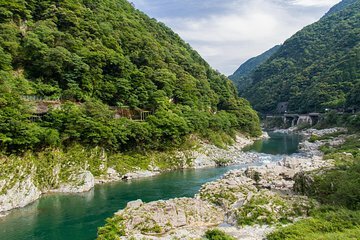 Switch places with Osaka for the day on a round-trip coach ride to Tokushima Prefecture. You’ll discover stunning natural features, such as the cherry blossoms that line the Yoshino River each spring. After a lunch of steaming Sukiyaki (hot pot), motor on to Oboke Gorge for a 30-minute boat tour. Then continue your sightseeing at the Kazura Bridge and Biwa Waterfall in the Iya Valley. During the cherry blossoms viewing season, roads and sightseeing spots might become heavily congested and arrival to each place might be delayed. In some cases, shortenings or omissions may occur due to congestion during this time. Also, the return time may be significantly delayed. The best time to view cherry blossoms varies depending on the weather and temperature of the season. This tour is organized with reference to the blooming conditions of previous years, however blooming season varies depending on the climate. In some cases you might not able to enjoy the scenery as shown in the photo. Visiting time at the sightseeing places might be shortened depending on the blooming conditions. Please note there will be no refund regardless of the conditions of the cherry blossoms. Wearing clothes and shoes that let you move easily and comfortably is strongly recommended. You will be descending down a slope and stairs (around 60 steps) to reach the boat. Comfortable clothing and walking shoes will be required for those 5~6 minutes.